Michael Franti is a peaceful warrior who believes in action over rhetoric. The outspoken leader of Spearhead traveled to Iraq, Palestine and Israel in the summer of 2004. Armed with video cameras and a guitar, he explored the very real human costs of life during wartime. The new documentary, I Know I Am Not Alone, details his trip, and the latest Spearhead album further burrows for meaning behind the bellicose situation in the Middle East. 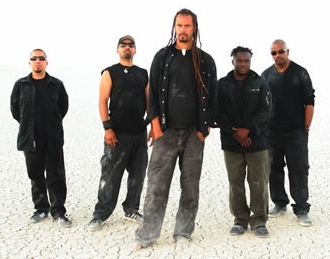 Recorded in Kingston, Jamaica and Franti’s hometown of San Francisco, Yell Fire! employs righteous anger, compassion and subtle laughter in addressing our troubled world. Surprisingly, given all the blackness he’s been immersed in lately, Franti was able to find five things to that inspire hope. I believe to have a happy life you have to attach yourself to something consistent. For me, that thing is love. The number one thing that gives me hope is witnessing the power of love on a daily basis. Loving kindness will bring a smile to a stranger, courage to a friend, a beginning-to-an-end between warring nations. Nature always provides us with abundance. If we have positive actions, positive beliefs, positive speech and a positive attitude then Nature provides an abundance of positivity. And the reverse is true for the negative, too. I saw people in the worst human conditions in war who were able to remain positive, people with an unyielding commitment to peace. In America it’s easy to be a peace-activist because you’re not going to get killed for it. But I’ve been in places where even saying you want to make friends with your enemies or put your weapons down can get you put in prison or killed. We don’t wake up wondering where we’ll get our next meal or if a rocket will smash through the roof of our house. One of the ways we can express our gratitude for that is speaking up for those who have to live in these situations. When I feel down about something the way I’ve found to cure it is to get involved. Rather than sit around and bemoan the war I went there and filmed it. Instead of being depressed about the state of prisons in America, I go sing and play music in prisons. Becoming involved helps me to feel happy. Music is part of my life every single day. It doesn’t matter if I’m doing a concert for thousands of people or recording alone. Most days, music comes in the form of my stereo or my acoustic guitar being played in my house or hotel room. It’s the thing that helps immediately change my perspective on whatever’s happening in my life. If I wake up sad, frustrated or just tired music will inspire me. This goes hand-in-hand with playfulness and remaining childlike. One of the ways we do that is by hanging out with kids (laughs). It’s my two sons (ages 19 & 7) that inspire me, that keep me thinking young, acting young and keeping my sense of humor.